When Brandhome’s hometown Antwerp became wrapped up in a political back and forth over whether to build a bridge or a tunnel to handle long-distance traffic, it quickly escalated into a full-blown communication crisis. By the end of 2009, Brandhome conducted a survey with local newspaper Gazet Van Antwerpen and Apen.be. Its conclusions were clearly negative for Antwerp’s then-mayor Patrick Janssens and the project itself, called BAM. What started out as an attempt to compromise and find a solution for all, ended up being damaging for everyone involved. The reason? Poor communication. Both the BAM project and the mayor himself can be considered as brands. The mayor’s brand was at one point even considered virtually untouchable. Until BAM came along. So what went wrong? First of all, a brand needs to create a communication framework that’s able to appeal to all relevant target groups. Once you have the framework, you need to come up with actual ideas and communicate them in a clear manner. So no throwing around opinions, speculations and vague press bytes and expecting your big communication budget to win everybody over. The power of good communication is harnessed by offering relevant content in the right tone of voice. When you don’t have the right tone of voice or the right content, you could end up with a communication crisis. Once that happens, there are several strategic options. One is to retreat and limit your input to a minimum. Another option is to adopt the naive “I had no idea” stance. 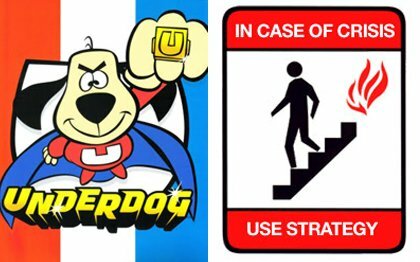 In some cases, brands opt to take full responsibility, hoping to generate goodwill by going for the ‘underdog effect’. A more popular option is the ‘reminding’ strategy. The brand suffers through the crisis, but reminds the public of all kinds of positive memories attached to the brand. Although damages can be downplayed this way, it’s also possible people are reminded of other negative things in the brand’s past. This happened to Ford when it took on tire giant Firestone. Somewhere around the millennium, the press got wind of several stories concerning lethal car accidents caused by faulty Bridgestone/Firestone tires. Almost all accidents involved a Ford Explorer. Before the exact cause of the accidents was determined, bot brands started openly speculating and shifting the blame. Firestone claimed Ford was using a faulty tire pressure, while Ford blamed it on Firestone’s alleged poor quality standards. The media had a blast. Old Ford stories were dug up, like the exploding Ford Pintos from the 70’s (who were also equipped with Firestone tires). The whole thing escalated, resulting in a global communication crisis for both brands. The precise cause of the incidents was never found. What we do know, is that Bridgestone’s stock was cut in half and Ford’s quarterly profits took a 16% hit. Even the biggest brands in the world are not immune to crises. Time heals all wounds, but let’s reminisce for a moment: I’m sure you can recall Nike and Ikea getting into hot water for child labour, the Coca-Cola infection, the World Online stock flop, Mattel’s Barbie dolls lead crisis or Honig’s salmonella salads. A crisis is no picnic in the park, especially when it catches you off guard. The consumer’s faith in your brand takes a dive, the perceived quality plummets, and underneath the brand recognition an unmistakable ticking is heard, until … BAM!